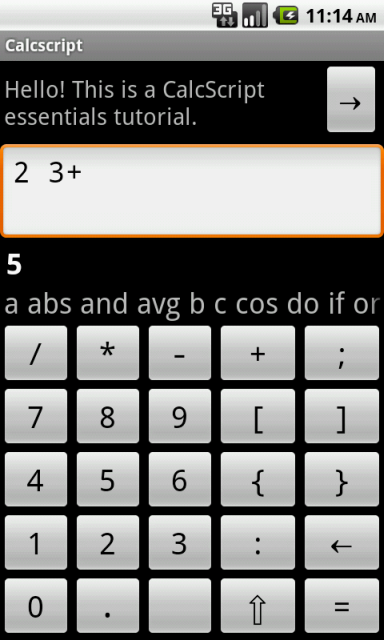 Calcscript is an advanced calculator that uses simple programming language based on Golfscript. Calcscript is designed with the purpose of executing complex calculations using minimum number of keystrokes. Send suggestions and bug reports to support. Live preview - the calculator executes what you write with every keystroke. Four native types: numeric, array, string and block. Over 40 different built-in operators. Defining your own operators and functions. Application includes simple tutorial for beginners. Two keyboard layouts for basic and advanced operators. Add searchable list of operators. Better design on Android 2.2. Allow opening calculator in popup window on Samsung devices. Add help messages (visible when using SPen or accessibility device). Changed behavior of the ⇧ key that no longer inserts the ` operator. To insert that operator use Search operators window. Minor layout fixes on tablets. Add operators: pi, tan, asin, acos, atan, sinh, cosh, tanh, e, ln, log, exp, hex, bin, oct, dec.
Add ability to hide not used operators. Add Show info command to variable context menu. Add ability to show full Android soft input keyboard. Fix operator base for base 1. Fix input box on Android 4.1. Fix operators ( and ). Disable soft keyboard when clicking on script input. Long-clicking on ⇧ inserts ` operator. Fix an error when removing text using on screen button. Improve layout - enlarge result and suggestions fields, make them auto-expandable. Insert tips when result text is clicked. Add more sensible error messages for several operators. 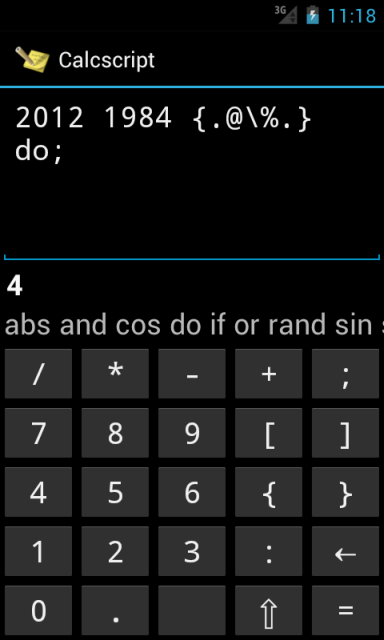 Add operators rand, sin and cos.